Relax into peace and serenity with the Stressless Capri (L) recliner. It’s broad seat, generous cushions, and classy design makes this recliner a natural addition to any home. Each Capri (L) comes with the patented Stressless Plus and Glide systems that adjust support for your back and neck according to your body’s position. The sturdy base and 360 swivel allow you to adjust your view throughout a room with ease. Put your feet up and relax in complete comfort with the matching plush ottoman. The Stressless Capri (L) offers luxurious comfort and support where your body needs it most. The large size is perfect for individuals of any size and stature. You’ll relax as the internal Plus and Glide systems work for you by responding to your body’s movement. Proper support is automatically adjusted for you at any angle. The sleek 360 swivel offer convenience to alternate your view with ease. The plush ottoman completes the package by supporting your legs and feet. Each Stressless Capri (L) recliner is built with superior materials and is meticulously crafted for advanced ergonomic support. You’ll feel peace and serenity wash over you as you relax in the Capri (L) recliner. With generous size and proportions, this recliner offers the support where you body needs it most. Need a smaller size? Check out the Stressless Capri (S) and Capri (M) recliners for identical looks and innovative technology. We ship to any address in all 50 United States. Ask for details regarding shipments to Canada. For quality assurance, all Capri (L) shipments must be insured for accident, loss, or damage. Once your shipment leaves our facility, a tracking number is provided via email. Unless otherwise stated, delivery means “to your door”. Shipments must be signed for by someone over 18 years of age. 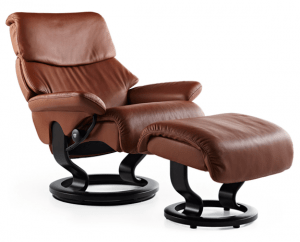 Ekornes offers a 10-year warranty on the internal mechanism. A 5-year warranty covers the chair and ottoman’s wooden laminate, including the swivel ring, all foam, and interior padding. It does not cover normal wear and tear, damage caused by misuse, or damage caused by unauthorized technicians. A 1-year warranty covers the leather upholstery. This is assuming the product has been cared for and maintained using recommended guidelines for leather furniture. Returns must be discussed within 48 hours of delivery.